Another great Stag or Hen activity to blow the cobwebs away after the night out in Aviemores' pubs and clubs. After a safety briefing you will be harnessed securely to the high zip wire and dispatched screaming like a banshee across the dark foreboding, but crocodile free, stretch of water. 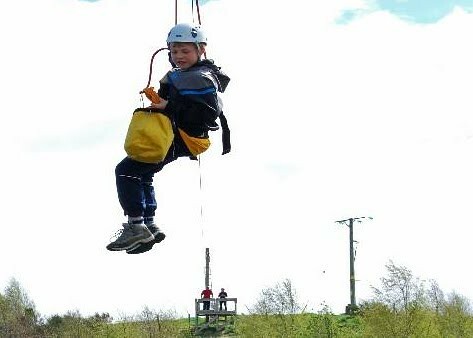 You probably will not be aware of the stunning views of the Cairngorms Mountains or the distant heather covered Hills of Cromdale as the zip wire stop comes thundering closer. Surely no bad language here as the impact of stopping rattles every bone in your body- Great- give me another shot of that! 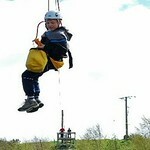 After all your Stag and Hen group have completed the zip wire 3 times each, then your instructor will normally give you the opportunity of a final abseil off the end platform, just to make sure that your nerves are totally destroyed. Stag and Hen groups often combine this activity with other activities at this site to form a multi activity kind of outing. If that appeals to you, call Gobabanas on 0871 789 6200 and ask our friendly Stag and Hen party organisers for more suggestions or advice.